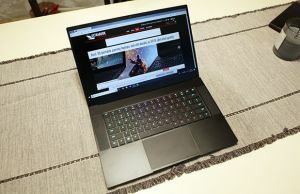 This article is a complete list of gaming laptops with Nvidia Pascal GTX 1070 and 1080 graphics chips, with details on some of their important particularities, prices and links towards more in-depth reviews that will take your through all their fine bits and potential quirks. If you want to jump straight to the lists, here’s the one of GTX 1080 laptops, and here’s the one of GTX 1070 options. We’re covering all the options built on the full-power versions of the GTX 1070/1080 GPUs in here, including full-size machines and the few existing thin-and-light models. If you’re however primarily interested in a slim and lightweight computer, you should also check out our article on laptops built on Nvidia GTX 1070/1080 Max-Q hardware, which is the lower voltage variant of the Pascal family, better suited for compact devices. That aside, quite a few portable gaming machines are also built on GTX 1060 graphics solutions, so you’ll also want to look over those options as well. With Pascal Nvidia no longer makes dedicated mobile chips for laptops, but solutions closely derived from to their desktop architecture, just slightly lower-clocked and tweaked in order to meet lower TDP requirements. This makes them overall considerably faster than the older Maxwell Mobile chips (GTX 970M and 980M), with increases in the 80 to 200% range, and just about 5-10% slower than their desktop counterparts. That makes the Pascal gaming notebooks much more interesting for those of you that are looking primarily at performance. Pascal laptops are not just significantly faster in games and VR, they also incorporate high-resolution screens with GSync support and up to 144 Hz refresh rates, various storage options, up to 64 GB of RAM, excellent RGB keyboards, Thunderbolt 3 and HDMI 2.0 ports, and pretty hefty batteries in most cases. Graphics aside, you’ll find GTX 1070/1080 notebooks mostly built on Intel Core H, K and HK (overclockable) platforms, with the latter Core i7 and i9 six-core Coffee Lake H variants offering a significant performance boost over the older quad-core Skylake and KabyLake lines. So if you’re buying a high-end gaming laptop these days, you should aim for a Coffee Lake configuration. The GTX 1070 Mobility chips are built on the Nvidia GP104 core, get 8 GB of DDR5 memory, have a standard clock speed of 1442 MHz (Boost up to 1645 MHz), a memory clock of 8008 MHz, 256 GB/s memory bandwidth, 2048 CUDA cores and a TDP of around 120 W. Some laptops offer dual GTX 1070 chips in SLI, while other offer factory-overclocked variants. You should expect full-power GTX 1070 notebooks to start at around $1700. 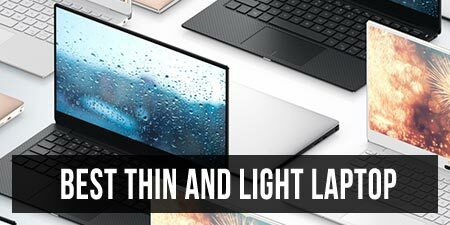 If you’re interested in the thinner and more compact variants built on GTX 1070 Max-Q graphics, like the highly appreciated MSI GS65 Thin, Gigabyte Aero 15x or Razer Blade 15, check out this detailed article over here, as well as our post on the best thin-and-light gaming laptops of the moment. 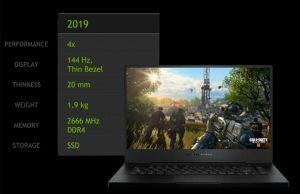 Performance wise, GTX 1070 laptops are able to handle all the recent games at FHD resolutions and maximum details, but also UHD resolutions on Medium-High settings. Compared to the desktop 1070, the mobile version offers 5-10% lower scores in benchmarks and games. However, compared to Maxwell mobile chips, the GTX 1070 laptops are roughly 65-75% faster than the older GTX 980M builds and about 120-130% faster than the GTX 970M models. The GTX 1080 chips are built on the GP104 core, get 8 GB of DDR5 memory, have a clock speed of 1506 MHz (Boost up to 1733 MHz), a memory clock of 8008 MHz, 320 GB/s memory bandwidth, 2560 CUDA cores and a TDP of around 150 W. Some laptops offers dual GTX 1080 chips in SLI, while other get factory-overclocked variants. Expect GTX 1080 notebooks to start at around $2200. If you’re interested in the thinner and more compact variants built on GTX 1080 Max-Q graphics, like the Asus ROG Zephyrus and Acer Triton series, check out this detailed article over here, as well as our post on the best thin-and-light gaming laptops of the moment. The Mobility GTX 1080 chips offers very similar scores in benchmarks and games to the desktop GTX 1080 solution. On the other hand, compared to the Maxwell mobile chips, the mobile GTX 1080 is miles ahead, showing 125% bumps over the GTX 980M chip and 180% improvements over the GTX 970M. SLI variants are of course even faster, and these are recommended for high-frequency UHD screens and multi-monitor setups. The single 1080 notebooks will handle most modern games at UHD resolutions and High graphics settings. That’s about it for now, but like I said earlier, we’re constantly updating the list. 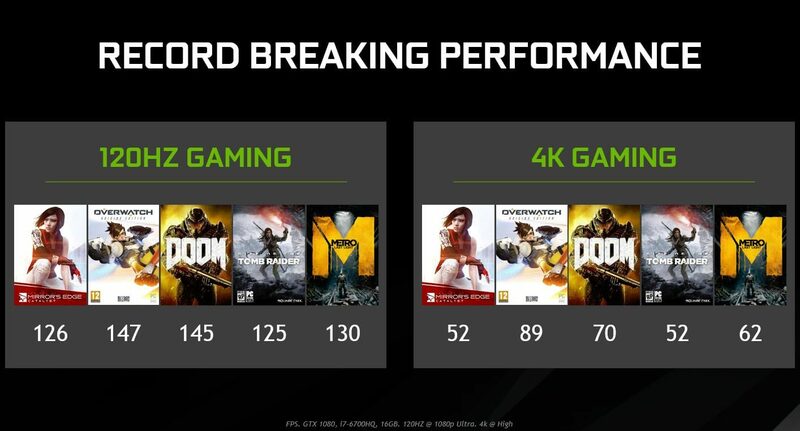 Bottom point, Nvidia Pascal is a major update for gaming laptops. GTX 1080 machines are now capable of running most titles on 4K resolution with high details, and if you want ultra-details or want to power multiple monitors at once, you can opt for the few solution with dual SLI GTX 1080 chips. GTX 1070 models are still faster than the high-end GTX 980M notebooks of the previous generation, while selling for less. They offer excellent gaming performance on FHD resolutions and will be able to run most titles on UHD panels as well, but you’ll have to trim down details to medium. Last but not least, if you don’t have $1500 or more to spend on a gaming laptop and still want something capable of running modern games on FHD resolutions, the Nvidia GTX 1060 laptops are the ones for you. They start at around $1300 and we’ve covered them in another post. 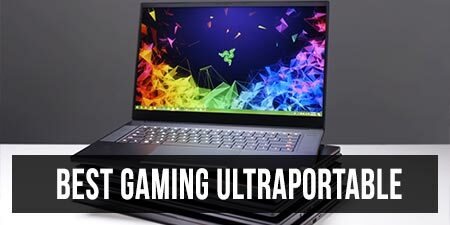 You can also check out our detailed article on ultraportable gaming notebooks in case you want a thin-and-light computer, or get in touch in the comments section if you have any questions or anything to add to this article. FYI: I think you have the batteries for the MSI models reversed. The GT72VR comes with an 83Wh battery (msi.com/Laptop/GT72VR-6RE-Dominator-Pro-Tobii.html#hero-specification) where the GT73VR comes with 75Wh (msi.com/Laptop/GT73VR-6RE-Titan.html#hero-specification). Right, that’s only an USB 3.1 1st gen port, thank for the headsup. Acer predator 17 is 17,3" not 15,6"
Can I check if the last entry on the 1080 list is right? Googling for ‘Schenker XMG U716 / Clevo P775’ gives me a late 2015 laptop with 980 card. There’s going to be a Pascal edition, but I don’t think it’s available yet. I can’t remember where I found details about this, but it wouldn’t be in here if I wouldn’t have find at least hints of an update. Looking at the specs on various sites it looks like the MSI GT73VR only has G-Sync on one UHD variant, FHD 120hz variants don’t seem to offer it. Is that why we have yet to see Asus release any G752VS variants with a 120hz panel ? GT73VR with 120Hz variant does support G-Sync out of the box, MSI doesn't list this feature either by mistake or some unknown reason. I'm using GT73VR @ 120Hz @ GTX1080 and screen does support G-Sync. FYI, the ASUS GL502VM (1060) has Thunderbolt 3, the GL502VS (1070) does not. The details are on the Notebook Check review of the VS. Right, I got things confused. Edited, thanks. Do you have any source regarding the asus gl702vs? This would be my dream machine but this post seems to be pretty much the only place on the Internet where it makes anappearance. Was updated during the first 3 days of this very year. Surprisingly no one's talking about it, and its not even been in CES 2017 as far as CES reporters are concerned. It also doesn't have the third fan as the VM model and sports a duo-copper heatpipe system compared to the tripple on the VM model which only has the 1060. More and more intriguing. Had the VS come last year together or just after the 17 inch VM and the 15 variants, Asus would have had 1 more customer, and probably a lot more, but looks like they did not want to kill sales of their more beastly 17 inches. Bad move IMO with so much great competition in that segment since the GTX 10 series came out. Can you confirm again for MSI GT62VR. Someone in reddit bought this and said its only USB Gen 2, not TB3 compliant. So for now, the only laptop with gtx1070 + TB3 is only ROG 752VS? To be frank, I mostly see the purpose of using external graphics through TB3 on a more portable computer with perhaps 1060 or 1050 graphics, when announced. The 1070 is already pretty powerful on its own, so unless you want to power a 4K external monitor, it might not be worth using a TB3 external graphics solution with a 1070 chip. At least imo. I see TB3 as a good future-proofing option down the road for what is a very expensive purchase. I think it’s extremely short sighted to write it off for top-tier GPUs right now, and I see this misguided approach come up a lot on other forums. In 3 years’ time, the 1070 will be the equivalent of the 1050 or 960m. But, your laptop will probably still be functional and fully working in every other way. Why wouldn’t you want the ability to just plug in a new GPU like a desktop when gaming from home, and still have something capable at lower settings for on the road gaming? Fair enough. I guess I haven’t considered this argument. I wish there were laptops with larger screens than 21″ and even can be mechanically set up to be two seperate pieces. It would be an iron man laptops turned desktop set up with a mechanical keyboard and no touchpad in the middle like traditional laptops. There's a 15.6" Eurocom Tornado F5 with up to i7-7700K, 64G and GTX 1080. Any news when you’ll review the new Alienware 15/17 with GTX 1060/1070? Also the Polaris version? Not really. I’d even say chances of a review are very slim, we don’t have contacts with Alienware so we don’t get review loaners from them, and we don’t plan to buy any of these just for the review. Sry. Hey guys, I can’t find any info on the Asus ROG GX701VI you talked about, except on this page. Where did you find info about it ? So I came across this site trying to find my first gaming laptop after over a decade of building desktop rigs. What I absolutely needed was a 1440p GSYNC display at >60hz and a GTX 1080, both for less than $3,000 after configuring all the other parts. Seems to me that I've got only a single option, the AVANT P870DM2-G from AVA Direct. I mean, I'm not disappointed, it seems to have everything I need and within my budget, but is there any particular reason why none of their laptops made this list? Am I missing something when it comes to them or gaming laptops in general? Thanks, I looked further into it and building my own Clevo seems to not only be a great compromise, but also really interesting and even better for my budget! Salut Andrei! Ne poti da un link cu un Clevo dotat cu Gtx 1080 la 1700Eur? Anyone checked out Eurocom?? Pricing is very competitive for a modular desktop replacement laptop. Desktop processors, multiple drive bays and ram slots, can have SLi too if your wallet stretches. Based around top of the range Clevo chassis from what I can see. Anyone used/seen/bought one?? Also, might be a daft question but all ALL the new 10 series cards MXM3 form factor?? Hello. Can you please update because I think some of the laptops that you have put scheduled or TBA by have been released like the Alienware 15 and 17 in the 1070 part. Thank you. Hah, you're right, I haven't looked deep enough. Thanks. I've updated the listings. Hello. Do you haopened to remember where you got the information on the Alienware 17 GTX 1080 release? I'm really looking forward to it. Thank you. Just got a message from Alienware support that the 17 GTX 1080 release will be on the 15th of November 2016. What would you recommend in a 2000 euros budget with gtx 1070? What's the difference between QHD with G-Sync and UHD? Because I don't think UHD comes with G-Sync and which would you suggest? Is there a reason why a lot of UHD are without G-Sync? so would you go with a QHD with G-Sync or UHD? QHD with GSync is gaming is what you want the laptop for. Oh. Um… I think you might want to update. GTX 1080 for the alienware has been released. Seems like you have advanced knowledge of upcoming laptops. Do you know if the Asus Rog 24 inch is still coming out or is in production? I saw all the May 2016 posts, but I haven't heard anything since. I haven't heard anything about it except for those initial rumors, so I'm inclined to say it's not going to be a real product. That doesn't mean Asus won't probably offer a bigger ROG at some point, but a 24-inch one seems too big for a notebook imo. Perhaps something closer to the 20-21" segment, like Acer's Predator X 21. Just suppositions though. Both Sagers have 120 herz monitors. The Razer Blade Pro does have a single TB3 on it. Has anybody bought anything in prostar market? Any new news on the Asus GX800? I was hoping this would release this year considering this was announced some time ago. However the final specs on this has changed several times. So it's hard to know what exactly the final version will be. About all I know is that it apparently is going to have 2 SLI cooled GTX 1080's unlocked. Haven't heard much else about it and I don't see it listed anywhere in Europe, especially in the Northern countries that usually get Asus products first. Perhaps after CES, although Asus don't usually tie their launches to CES like Lenovo or Dell do. I'm looking for a powerful gaming laptop with a minimalistic appearance (like Gigabyte's P37X v6), but *without* 4k. I can't get a hold of that one with a 1080p resolution, so I need some other suggestions. Anyone? Did you find anything that fulfills your criteria? I'm in the market for new laptop with pretty much exact criteria. Kaby lake + gtx 1060/1070 under $2000 with STEALTHY, not flashy at all, no gamer-ish laptop. Any suggestions? Btw I think gigabyte has new p37x v7 in 1080p variant as well. But last gen p37 cost like $2400 or something :( Evga's new laptop? or maybe the gs73? Aorus looks much better as well. Origin PC EON17-SLX does have Thunderbolt 3. Actually it has 2 although the website says 1. The customize and buy page lists the 2. Origin PC EON17-X also has a Thunderbolt 3 according to the specs when you go to customize and buy the laptop. The page for it doesn't say anything about it. Thanks for the heads up, updated. Such a shame that Aorus made the bonehead decision to leave TB3 off their latest generation. Would have given the Razer Blade Pro a run for its money. Who the heck approves a high end laptop not having a TB3 in late-2016/2017? Was an instant sale killer for me given I have equipment that requires TB3. Nice looking laptop, great profile and weight, great price, and great features other than the missing TB3. Shame. Also the very popular dell 7000, $800 laptop with gtx 960m is refreshed with 1050 and kaby lake cpus. Acer has vx15, another $800 laptop for the competition with slightly better hardware (ips screen etc.) I think u should strongly consider writing a new post for 1050/ti laptops as they are going to be really popular and most people are not willing to spend over $1500 for a laptop. Thank you. 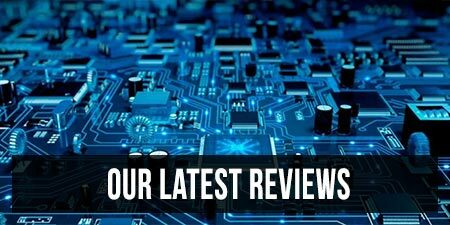 And of course update the kaby lake based laptops articles as well with the relevant links to other related articles as well as including the new additions. Thanks again. Good day! I gotta say this because I visit this site almost everyday for new laptop updates and those lists by GPUs and CPU generations are so damn helpful! This list is missing the Asus GL702VS. It has a 1070, 120hz FHD screen with Gsync, and is pretty thin and light for a 17" gaming laptop. Thanks Ryan, I've added it to the list. That's a great new laptop and unfortunately it's not available in my region yet. I'm pretty sure others would love to find more about it, so if you want to share some thoughts and pics with us, I'd gladly them in a dedicated article here on the site. Let me know if that sounds interesting and I'll get back to you on email. 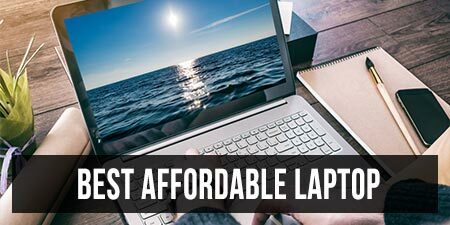 which lap top is the most powerfull laptop in this list? in display, sound, graphics and speed performance? There is no MSI GT83VR 6RF Titan Pro at all. MSI didn't release it yet and sadly there is no configuration with 4K display with G-Sync for this laptop.